I am back from my holidays and I have been so busy with school and life right now so I am sorry that I couldn't write more blogs. Recently, I am trying out YouTubing again but not satisfied with the outcome so I haven't been uploading that much. 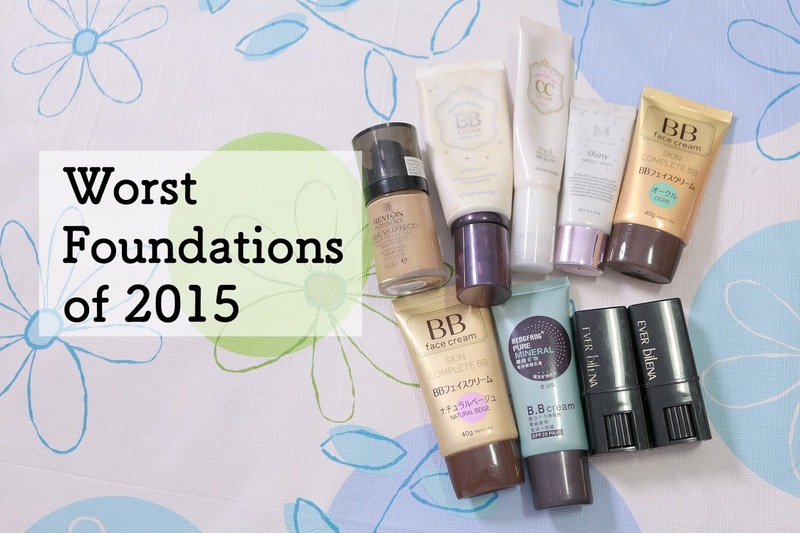 But today I want to share with you all my worst foundations of 2015. I try a lot of foundations as you guys can see from a variety of price ranges. I have acne scars, combination - oily skin, very easy to break out skin so it is very difficult to find the ones that I really enjoy. I am going to put each and individual foundation's reviews up soon so today I am just going to put my list. Daiso BB Face Cream "Natural Beige" & "Ocre"
Daiso Ever Belina Foundation Stick "Natural" & "Ocre"
Revlon Photo Ready Foundation "Beige"